Why not rent an injection molding machine, rather than buy one? CMJ Kunststofftechnik is setting store by the KraussMaffei Rent-it business model. Decisive arguments for renting instead of buying the new all-electric PX 80–380 injection molding machine were above all the prospect of a machine that is always state-of-the-art, more flexibility in production and reliable financial planning. CMJ Kunststofftechnik is a young, aspiring company in the region of Freyung-Grafenau in Lower Bavaria/Germany. “The new Rent-it offer from KraussMaffei is ideal for our purposes. It provides us with the opportunity to always be in step with the state of the art and to offer our customers the best production opportunities on affordable terms. This is a great advantage,” explains Christoph Eder, founder and Managing Director of CMJ. The leasing period for the new all-electric PX 80–380 with a clamping force of 800 kN is initially three years. The customer can then decide whether to extend the contract, keep the machine or conclude a Rent-it contract for a new machine. This also provides the opportunity, for example, after the experiences gained over the past years, to change to another, for example a greater clamping force, or to book additional technical options. The new all-electric PX 80 is replacing an old hydraulic injection molding machine at CMJ. The company produces around the clock, seven days a week. With these numbers of units and owing to the improved energy efficiency, the changeover to the new all-electric injection molding machine will pay off very quickly. At the same time, requirements are rising, the market is changing and increasingly demands greater flexibility from manufacturers. “We often receive orders with order lead times of just a few years. If we purchase a new machine for this purpose, we must then utilize it to its full capacity. With the Rent-it model, we can flexibly hire the production capacity only for the required period,” explains Eder. With the Rent-it model, KraussMaffei is cooperating with an internationally active leasing company and offers two packages. In the “Speed & Standard package” with a predefined leasing period, which covers systems of up to 250,000 EUR, the contract processing is fast and convenient at the customer’s facility. For orders with large volumes of over 250,000 EUR there are multiple customized options (“Flexible & Tailored”) with premature return or contract extension — and the financing partner therefore also backs this with comprehensive customer support. 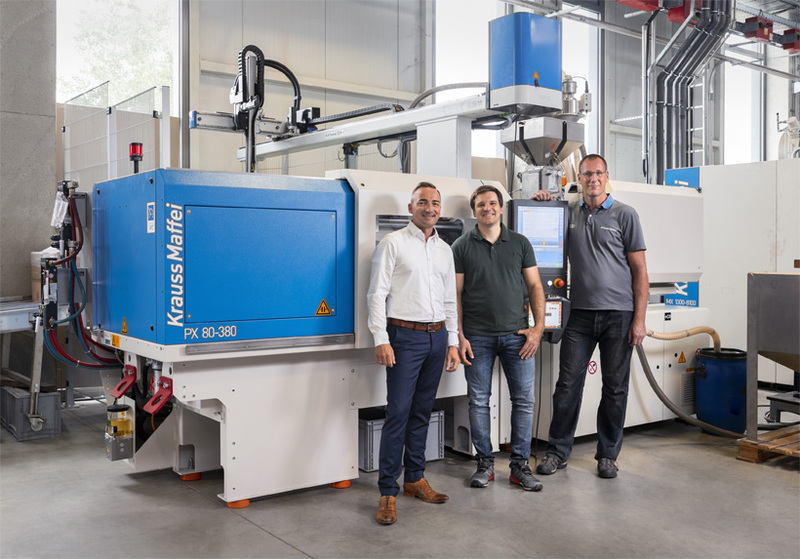 State-of-the-art machinery, more flexibility in production and greater reliability in financial planning — for Christoph Eder, the Rent-it model from KraussMaffei is a guarantee for success which will support the young company CMJ in its future growth. There is sufficient space for new injection molding machines in the new factory hall, which is to be ceremoniously opened this year. And if the words of Christoph Eder are followed — by all means as Rent-it models.